It seems that the ASPM of the Intel 82574L is broken. The corresponding Linux driver “e1000” therefore has this chip on its ASPM blacklists and disables it when the systems boots. However, there is some side effect which re-enabled the NIC'S ASPM state L1 after a network connection was established. This does not happen on all Linux flavors and kernel versions, but it happens at least on Scientific 6.3 with kernel 2.6.32-279.19.1. I hope this helps someone else in some way. About a month ago, I introduced the “Puppet boilerplate modules” project with the goal to help users to create Puppet modules in a fast and comfortable way. I got much positive feedback and the “new module wizard” helped to create tons of modules for e.g. the companies I work for and with. Everything seems to be fine so far. But what I really want to write about is a new GIMP example module I created for the puppet-boilerplate-modules-example-content repository. It is based on a new boilerplate (application-004) which comes with additional preparations for software with plugin/extension/modules (or however the application's nomenclature calls such components). So check it out if you want to see what to expect and if the new content might be useful for you. Viele Nutzer von goQR.me1) haben regelmäßig nachgefragt, ob wir nicht Grafiken in QR-Codes einbetten und für den Druck aufbereiten könnten und wieviel das Ganze kosten würde. Daher kamen wir zu der Überzeugung, dass es sinnvoll ist, diese Dienstleistung auf einer eigenen Unterseite anzubieten: QR-Code mit Logo. QR-Codes sind ein ideales Mobile-Marketing-Instrument. Sie lenken durch ihr ungewöhnliches Äußeres den Blick auf sich und können mit einem Smartphone in Sekundenschnelle gescannt werden. Eine Grafik im QR-Code erzeugt zusätzliche Aufmerksamkeit und zeigt schon vor dem Scannen sofort, um wen oder was es geht. Probiere es einfach aus. Disclosure: Diese Dienstleistung wird von meiner Firma erbracht. Many users of goQR.me2) asked us if we could embed print-quality images into their QR Codes and how much this service would cost. Therefore we thought it would be useful to offer this service on a separate page. So there it is: QR Code with logo. QR Codes are a great mobile marketing tool. Their unusual appearance is raising awareness and they can be scanned in seconds with almost every smartphone. A Logo QR Code works even better for most advertising purposes because the graphic creates additional attention and shows the user whom or what to expect before scanning it. So check it out. Disclosure: this is a service of my company. 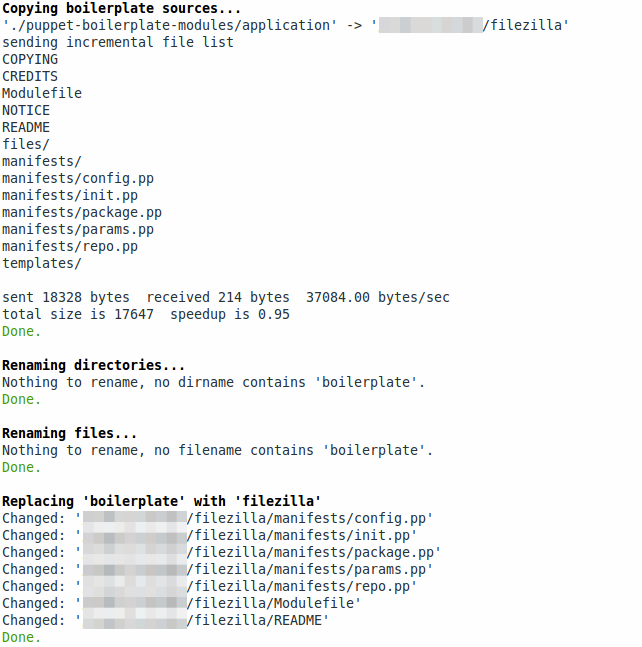 My colleague and I are maintaining a “Puppet boilerplate modules” project (something like puppet module generate on steroids). To keep up with the OSS spirit, we thought it would be a good idea to share it with the community. Hint: You can provide the answers by using parameters. Use newmodule.sh -h to get a parameter listing and usage instructions. 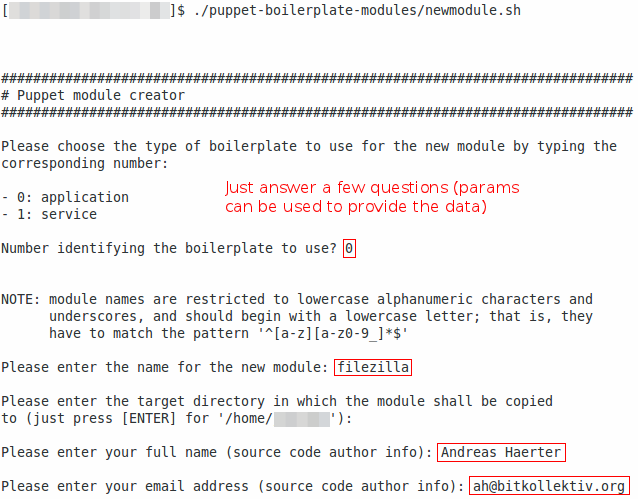 The puppet-boilerplate-modules-example-content repository provides example modules and rendered4) documentation (created with ). It should give you an impression of what to expect from and how to use puppet-boilerplate-modules and if the project might be useful for you. Contains the main module class. It validates the module parameters and coordinates the actions (e.g. by chaining resources). Sets the default values for the parameters of the main module class (→ init.pp) and manages internal module variables. Therefore, many operating system dependent differences like package names are addressed in here. Coordinates all software package management related actions. Normally, there is no need to edit this file. Coordinates all configuration related actions. Many modules won't need this because most there is no need for a special application configuration. If so, just delete the file and the references in init.pp. Coordinates all package repository related actions. Many modules won't need this because an additional repository is not needed to install the application. If so, just delete the file and the references in init.pp. Everything you must edit/check after you generated a module is marked with a FIXME/TODO. E.g. when the package list or some class calls when using the application-002 boilerplate. 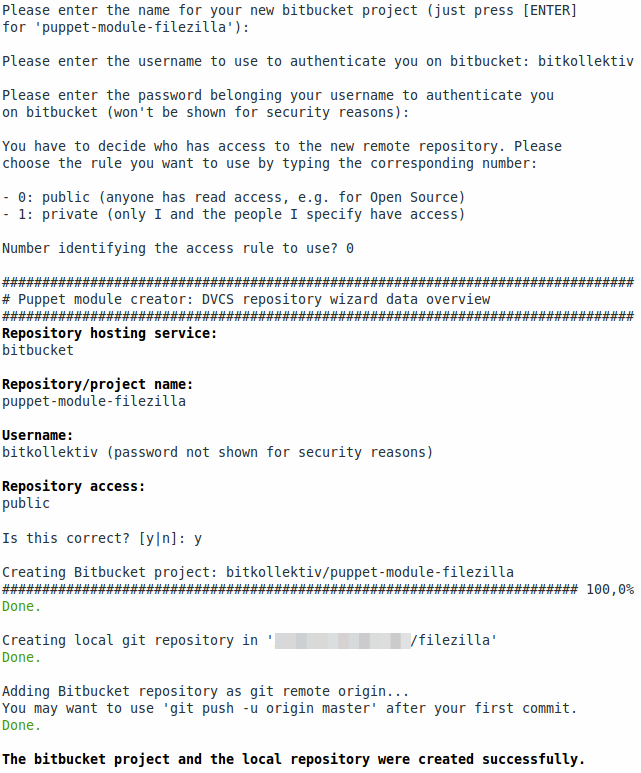 You don't need to use GitHub/Bitbucket. The DVCS repository hosting part of the wizard is completely optional. There is always room for improvement. If you're able to add any contributions to make our project better, please let me know or discuss your thoughts right here in the comments. 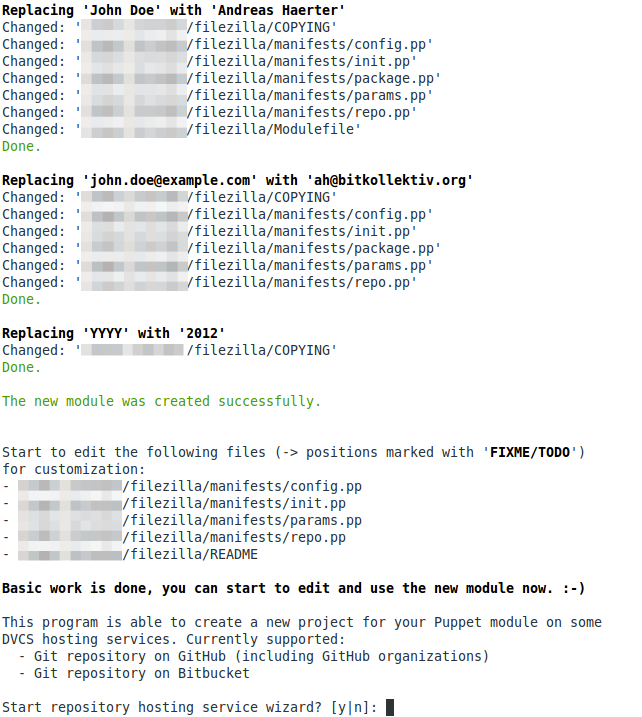 Update 2012-05-30: I changed the links and text regarding the new puppet example content. 2012-05-07 // LSI 3ware RAID controller: "Parameter not changeable"
I upgraded the OS of two servers last weekend. The planned downtime was also used to install LSI 3ware 9650SE-4LPML RAID controllers plus Battery Backup Unit (BBU). The BBU enables the controller to keep the write cache during a power failure. However, I was not able to create a RAID array with “Write Cache: enabled” on one system. I always got the message “Parameter not changeable” when the configuration was stored. The solution was simple: wait. The Battery Backup Unit (BBU) on the system was not charged enough, therefore the controller denied enabling the “Write Cache” setting. So if you get the message “Parameter not changeable” when configuring a LSI 3ware Raid Controller, check if the “Write Cache” setting is the root of it and if a charging or failed BBU caused it. You can check the BBU status in the Controller BIOS Setup (I found “BBU Ready: no” in “Information→Battery”). I'm fairly new to the Red Hat and Fedora Linux eco-system. Therefore I just wanted to teach myself some details about RPM and YUM today, especially how to use the commands to handle package signatures and repository GPG keys.5) I noticed many unanswered forum postings during my research. That's why I decided to write this little blog entry, helping search-engine users to find more answers than questions. As you can see, my example RPM knows about the GPG keys 0x00A4D52B and 0x069C8460. This command would remove the GPG key with ID 0x00A4D52B. This command would load the the GPG key 0x00A4D52B from a public keyserver and import it into RPM. Please note that SKS keyservers need working TCP connections on Port 11371. RPM needs the correct public key for this check. If you don't know how to get it, read on to learn what to do. A perfect real-world example is the RPM Fusion setup to configure the RPM Fusion repositories on your Fedora system. They provide setup packages to install the needed .repo files and GPG keys without hassle. But you should verify them to make sure they are not altered and are really containing the original RPM Fusion keys instead the ones an attacker is using to sign it's malicious packages for his fake repository. You can make it readable with date -d @$((0xYYYYYYYY)) "+%Y-%m-%d %T"
Puppet is a9) powerful open source tool to automate the configuration of and software management on Unix-like10) operating systems. This posting is a distillate of the resources I collected during my Puppet learning phase. I hope it helps to get an overview about what Puppet can do for you and how to use it (plus providing existing Puppet users some new ideas or tips). Puppet Labs Docs: Learning Puppet, especially “Part one: Serverless Puppet” teaches the basics. Master-less: What do I lose? Why should I use a puppet parameterized class? Puppet Labs provides YUM and APT repositories. If you need a newer Puppet version than the one offered by your distro repository, have a look at yum.puppetlabs.com and apt.puppetlabs.com. You might need to tinker a little bit to get a working repository file. Puppet is also useful in very small IT environments like e.g. your home network. Even with only one system to maintain, you may want to automate things e.g. for fast re-installation (a central Puppetmaster server is not mandatory, cf. so called “masterless” mode → puppet apply site.pp). Compare the situation with a source code VCS: Thousands of developers are using something like Git for their source code, even if they are the only developer of a specific project. The reason is that Git is not just a tool for “big teams and corporations”. It provides functionality every developer can benefit from. Same for Puppet: even if you got only a few computers to maintain, you may want to automate things plus documenting your setup by doing so. Puppet provides functionality every administrator can benefit from. The current MS Windows support is not really worth to mention. Since PHP5, methods can return objects (including $this). This enables you to chain the method calls after preparing your class by returning the object itself. Therefore, “Method chaining” may save you e.g. much copy & paste or chars to type, reducing typing time for dozens of $obj->method() calls. You simply can't see if a class supports method chaining without trying it or looking at its source. The need for all these return $this; within the class methods. IMHO, both reasons are leading to inconsistent coding styles and behaviors in real world applications containing 3rd party classes. vector – current MediaWiki/Wikipedia look and feel. monobook – traditional MediaWiki/Wikipedia look and feel. prsnl10 – minimalist template, suitable for portfolio and personal websites. mnml-blog – minimalist template, suitable for blogging with BlogTNG. All of them are compatible to “Angua” and its awesome new media manager. Have fun. Bei PayPal einloggen und sicherstellen, dass keine Transaktionen mehr offen sind. Den Anweisungen folgen und gefühlte tausendmal bestätigen, dass man es mit der Schließung des Kontos ernst meint. Der Link ist scheinbar nicht mehr direkt über das PayPal-Menü aufrufbar (meiner Erinnerung nach war früher ein entsprechender Punkt unter “Mein Profil” aufgeführt). Aktuell findet man den Link über das interaktive Hilfecenter via Suchwort “kündigen”. Um sich die Sucherei zu ersparen sei der Direktlink hier für's “Archiv” verbloggt. Some userspace programs got problems with the 2.6.x→3.x kernel numbering transition. To prevent the need to fix everything at once, the Fedora developers decided to ship 3.x kernels as 2.6.4x on Fedora 15 Lovelock and use the correct numbering scheme on Fedora releases ≥16 Verne. This kernel version numbering hack makes some problems with the current VirtualBox 4.1.6 on Fedora 15: /etc/init.d/vboxdrv setup exits with an error (/var/log/vbox-install.log says that recompiling VBoxPci-linux.o failed). The reason is simple: A check thinks that the running kernel 2.6.41.1 is older than 3.1. Therefore the wrong header file gets included (asm/amd_iommu.h instead of linux/amd-iommu.h).